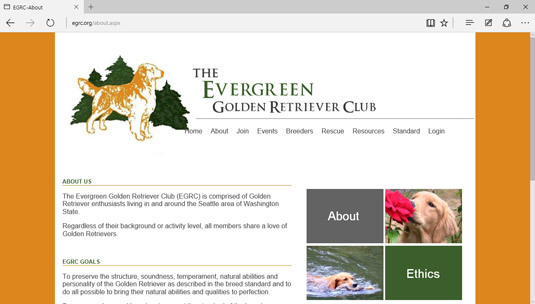 With Windows 10, Microsoft introduces a brand new browser: Microsoft Edge. Microsoft Edge was designed to load web pages more quickly than its predecessor, Internet Explorer. It also features a less-cluttered screen with no drop-down menus and dialog boxes for making settings, just a few simple buttons and an address bar along the top of the screen. You can use tabs to open additional pages. With settings you can manage from the More Actions button, you can change what appears when you first open Microsoft Edge. Internet Explorer will still be available behind the scenes. It will open automatically whenever you try to browse to a page that hasn’t been updated to open in Microsoft Edge. Windows 10 includes Cortana, a built-in search assistant that can find files and apps on your laptop and information on the web. Even better, you can use your voice to search with Cortana rather than typing. 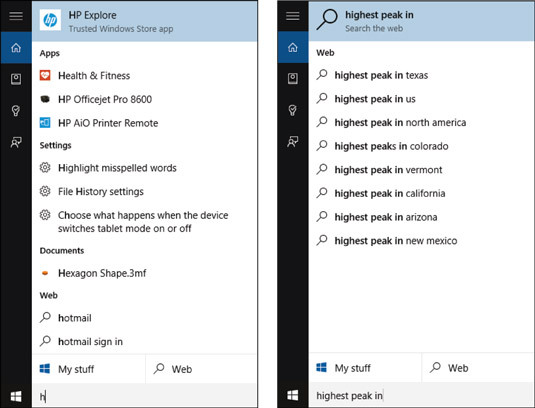 Click in the Cortana search field on the taskbar, and begin typing a search term or phrase. Notice that if you type a single letter or short phrase, Cortana might at first show a list of matches from multiple categories, such as Apps, Settings, and web. Continue typing a search phrase to make the search more specific and narrow it to fewer categories. For example, the right side shows only web matches. Click an item in the list of matches. Cortana opens the Microsoft Edge browser and displays a list of matching Bing search results. Click a link in the search results to go to that web page. Searching by voice works very naturally. With an external or built-in microphone connected and ready to go, click the microphone icon at the right end of the Cortana search box. Then ask a question like What’s the weather? or How many feet in a mile? The answers to such simple questions appear in Cortana’s window. If you say a search phrase such as blueberry muffin recipe, Cortana launches Microsoft Edge and displays matching Bing search results. With some questions, such as Cortana how old are you? she’ll respond verbally. If you come across a phrase or term on a web page that you want to learn more about, drag over it with your mouse to select it. Then, right-click the selected term and click Ask Cortana in the shortcut menu that appears. A pane filled with helpful information about the topic appears to the right. After you finish reading the information, click back on the web page to close the pane.